CESAR Mini-Joys Dog Treats Cheese & Beef 100g is rated5.0 out of5 by1. 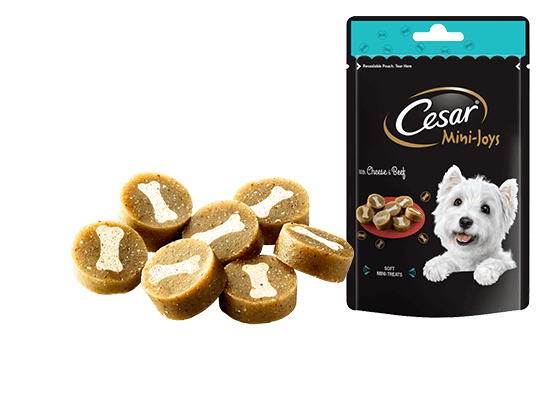 CESAR® Mini-Joys treats for dogs are delightfully delicious. This combination of savoury cheese and beef in a soft and mini sized treat is sure to satisfy your best friend. At CESAR® we are as passionate about dogs as you are. That's why delicious CESAR® Mini-Joys dog treats are perfectly designed for treating. Toy dogs (2-3kg), feed up to 6 treats per day. Small dogs (4-9kg), feed up to 10 treats per day. Medium dogs (10-15kg), feed up to 22 treats per day. Medium-Large dogs(16-24kg), feed up to 30 treats per day. Large dogs (25kg+), feed up to 45 treats per day. Please reduce main meal accordingly. Use withing 14 days of opening. To maintain quality and freshness after openin, use the reseal device. Fresh drinking water should always be avaliable.